With the invention of the daguerreotype in the mid-19th century, Americans adopted a strange tradition. 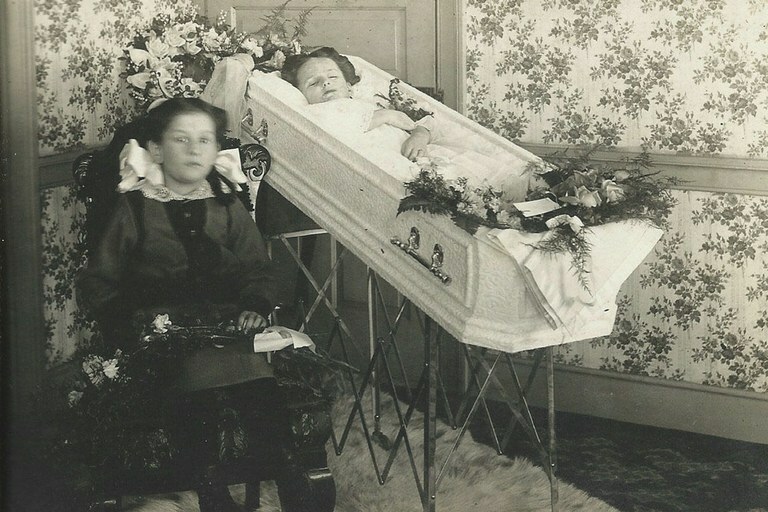 They took family photographs of their dead. Families dressed the bodies of children or parents in their finest clothes, then sat them in a rocking chair or laid them out on a divan. Sometimes, they stood the body up, and relatives gathered around the corpse, Christmas card-like. 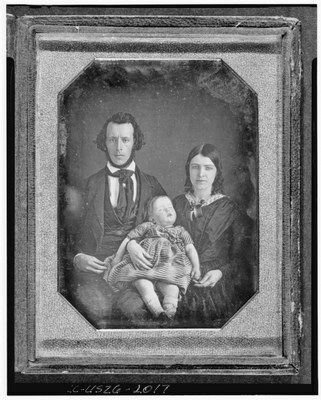 Often, given the rates of infant mortality and the relative novelty of the medium, this was the only family photo that existed. It’s a morbid habit, but not a new one. Pliny writes famously that painting “originated in tracing lines round the human shadow,” just as early daguerreotype advertisements claimed the technology would “catch the substance ere the shadow fades.” Right at the onset of a new technology, one whose future iterations would so display the muscles and ripples of movement — of what it means to be alive — people used it to do what they’ve always done: capture their dead. For many years I owned a flip phone. When I finally bought an iPhone, I decided to download a game. This was a big step for me; I’m not an iPhone sort of guy. But Monument Valley, its creators promised, was a game full of “illusory adventure, impossible architecture, and forgiveness.” That sounded good. Ida, a young girl in a white dress and conical hat, navigates different levels, each with its own fantastic structure: ruins of cities, mazes, a jeweler’s box of mirrored rooms, waterfalls falling out of empty buildings. The game plays with perspective. Ida begins a level at one spot and through a reshuffling of architectural and geographical elements, she M.C. Eschers herself to a point far distant. For much of the game, you manipulate angles, tapping and swiping until the physically impossible occurs. Columns appear different sizes, or a stairway seems to end in midair, but then the structure is twisted round, and a path beckons towards a place previously inaccessible. Sometimes, crows pester the landscape, blocking Ida’s path, cawing at her with big, loud beaks. A holographic figure called the Ghost, the game’s storyteller and cliché old wise man, floats around and offers equal parts wisdom and scolding. Mostly, though, Monument Valley is a solitary game. You and Ida figure a problem out. I played in bed in the morning or before I turned out the lights at night. When Ida reaches the end of a level, she takes off her hat and sets loose a spinning geometric shape. It floats in the air and lands on an altar. This is her offering, her ritual, her monument. The game hinges on its mystery: What does she offer and whom does she offer it to? What does she seek “forgiveness” for? 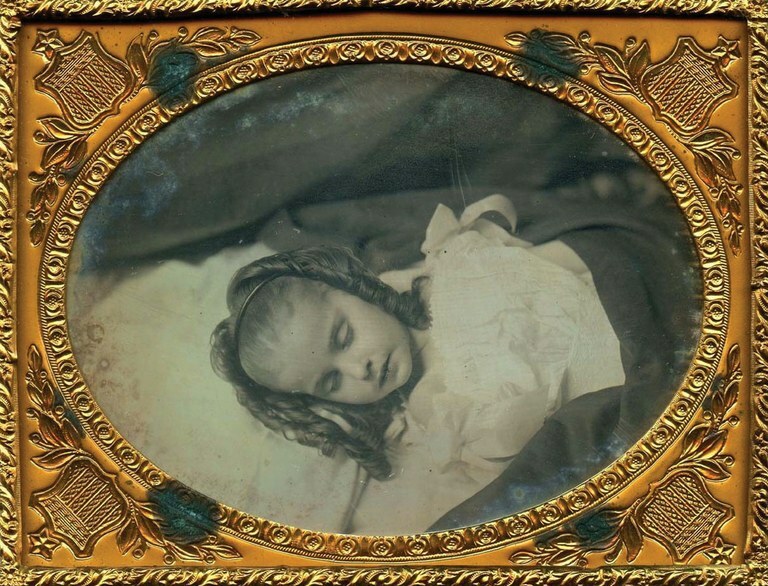 Something uncanny happens in these photographs of the dead. Daguerreotype exposures took notoriously long to develop, and living subjects needed to sit still for prolonged stretches, minutes sometimes, with their heads braced and bodies propped perfectly still. Often, since the dead died at all ages and the family dressed identically and assumed monochromatically placid expressions, it becomes difficult to determine, when looking at a photo, just who is the corpse. It’s only when you study two pairs of hands under their cuffs — one a shade darker than the other — or notice how one family member sags a bit against a cushion, that you find the detail that separates living from dead. These photos must have confused a sense of order. We say the living and the dead should not mix. The dead live in the land of the unknown and, if someone shuffles that seemingly impossible path back to the living, then something has gone wrong. Orpheus and Eurydice. The night watchman and the ringing of the corpse’s bell. A ghost is a manifestation of guilt, a forgiveness demanded, a memory contested. Our way of dealing with the uncomfortable truth: The dead do not return to life, but they do return to the living. Like a daguerreotype, an iPhone is an intimate object. You hold one in your hand. You cradle it sometimes. There, relatively cheap and available, hovers the past. About three-quarters of the way through Monument Valley comes the twist. The Ghost upbraids Ida — “Shameful Ida, why do you come back here?” — and she lowers her head. When she does, we realize her hat forms an inverted beak and that she and the crows are one and the same. Like the game’s architecture, we have only witnessed her from one perspective. Ida is in mourning and each sacred shape she returns is also one she stole. Her monuments disguise her thefts, her paths through these ruins her penance. Once I stood in a cherry orchard on a hill overlooking Prague. I had just turned 20 and, although I did not know it, my father was about to die. It was Halloween and I would dress up that night as one of the seven deadly sins. I seemed to be both myself and not myself at the same time. The cherry orchard still had its leaves. They were yellow and magnificent and carpeted the ground. There were rows and rows of cherry trees, so many that wherever I stopped there were four directions to choose from. It seemed these paths were multiplying, that they formed all possible paths one could take in a life. When I stopped walking the orchard, I climbed a tree. The fruit still hung from the branches, and I ate too many cherries and spat the pits out on the ground. Sitting up in that tree, I wondered: When are you most yourself? Is it when you do what you do every day, or is it when you do something for the first time? Like, say, when you dress up as “Greed” for Halloween — are you more yourself then, or less yourself? Like, say, when you find out someone you love will die. Are you more yourself or less yourself? Like, say, when you’re gone, and someone tries to capture your ghost. I climbed down from the tree. I wiped my jeans off and picked one last cherry from the ground. I walked back along the same path. The rows and rows of cherry trees merged, and it no longer felt as if I could walk down all possible paths, as if they held all potential sums and endings. I figured it didn’t matter one way or the other. For a long time after that, I thought memory worked like an encyclopedia. In order to remember someone, I would need all our experiences alphabetized and annotated. I must not forget anything. Then I thought, since the person I knew was only one aspect of the person who lived, I’d also need the memories of all the people close to him. We’d layer them one around the other, like a tree with its rings, so that the form of the whole was dependent upon the advancement of each part. But if I needed all the memories of those who knew this man, I’d also need the memories of those who didn’t: the woman who brushed his hand on a subway pole, the stranger who didn’t talk to him on a plane. The flowerbed he weeded, the family pet, his favorite tree — I would need to give these language and add them to the book as well. Yet even this wasn’t enough. Because what I really needed was the experience of the person himself, the person lost. And for this, he would have needed to have kept his own encyclopedic account. Still, this record would only exist of that one person at one specific time, and so unless he recorded every single thing that happened at every single moment (every passing thought, every urge, every decision or indecision he did or did not make), the book would be incomplete. And if he did record everything that happened, he would do this and only this for all of his life and thus have no real life to live. I didn’t know what to do. I grew angry for a long time. And, of course, the person I most wanted to talk to about this was the very person I was trying to remember. Though I did not know it, I was thinking of Monument Valley. The place, I mean. When viewers first saw its footage in John Ford’s Stagecoach in 1939, they assumed this site, one of the most photographed on earth, stood in for all of the American West. The land of the unknown — its myth, its grandeur, its memory — rendered in 5 square Cinemascope miles. If all that unknown land is out there, I thought, how do we choose just one path to stand in for all the rest? What is the right memory in the face of all we’ll forget? I began to suspect that the mind that haunts its past is not the shadow but its captor. That a ghost — the being that seeks forgiveness, the being that returns when something has gone wrong — isn’t necessarily the one who’s dead.